(CNS): Recipients who leave their parcels at the post office for more than two weeks will be paying a ten cent a day fee to the post office starting next month, as the service begins enforcing an existing regulation. This fee, known as demurrage will be levied when customers exceed the standard time applicable to importing goods and the Cayman Islands Postal Service (CIPS) said it is part of the Postal Regulations – section 60 (2) . Postmaster General Sheena Glasgow said its enforcement is meant to encourage customers to collect their packages in a timely manner rather than be truly punitive. “At ten cents per day per package, the demurrage fee could only be considered a token storage charge when a package has been uncollected formore than two weeks. The Airport Post Office now processes the incoming package traffic and even there, space is a finite commodity so long-term storage simply is not feasible,” she said. 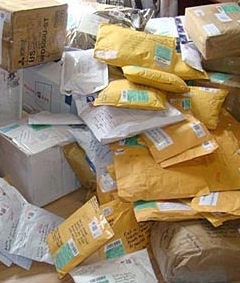 Customers should also note that if packages remain uncollected after 35 days of the addressee first being notified, they are classified as undeliverable and may be returned to the sender – if the item bears such instruction — or handed over to the Customs Department for disposal. I dread to think what really lies behind all these unclaimed parcels but suspect the reason is moe likely to be the appalling postal service, the ridicuous taxes that can be levied when parcels arrive, and failure to notify people that they have parcels to collect. The ineptitude of the postal service generally is beyond belief now – and this can only add to that image. I mean, has anyone noticed that the new, quicker, method for collecting parcels is actually much, much slower and now involves many more people in the process? Yeah that's progress! Worst postal service who lost and at best deliver well late asking us to pay for them to hold parcels which they more often than not fail to inform us of in the first place? Hilarious. Why no just start deliveris touses and EMPLOY Caymians to deliver on bikes and motorcycles like other supposedly less advanced islands do? Sorry my keyboard started playing up when I posted this^. Final paragraph should say why not just start deliveries to houses… etc. Hahaha is this a joke? It take forever for them to send you those notices in the mail in the first place. By the time you've received the notice, it's probably already been sitting there for two weeks. The solution is do not use the Cayman postal service for anything, ever. Privatise the entire system. It is a drain on the economy. Yeah right. They can't even collect a parcel 20 feet away with any enthusiasm so collecting storage fees? It just ain't going to happen. I recently found out that a package sent to me by a relative was returned by the post office. Of course, they never informed me that I had a package, they simply sent it back and left the impression that I refused it. Fine work, people, fine work indeed. I guess I should just make a habit of buying whenever I am off island. The post office cannot get my bills to me in the right box, why should I expect them to ever get my packages right. It takes 2 weeks to get packages from Grand Cayman to Cayman Brac. After paying for express shipping having the postal service just chill with your package now they want to charge a holding fee. Post office holds the stuff anyway. Either charge a meaningful fee per day or don't charge. This suceeds in annoying everyone and acheiving nothing. This is simple. Stop funding the post office day care system and using it as an extension of the welfare state. Put it out to tender, let the existing staff re apply for their jobs and streamline the brac to one post office. With the money expected to be saved, pay the fire department what they are due in back pay. Retain regular fire fighters for the airports and Georgetown. The rest, make them into a part time call out who are paid when called out. Either open up CIPS to proper market competition or privatise it. Terrible service, terrible front office attitude, arrogant back of attitude, everything that is wrong with astate monopoly mixed with a little islander attitude. It would be alright if they maintained reasonable hours for package collection. You can only get your package between 11am and 2 pm. Many, many times there is no Customs Officer present during that rediculously small window of time. I took off of work to collect my package and waited 45 minutes for a customs officer to show up. Then they act like they are doing me a favour to do their flipping job. You cannot complain because they will jack up your duty, or hold your package hostage. It is worth the extra cost to send FedEx. The management of the CI post office are clueless. In other words they will now charge more for even less service. This is how business is done by CIG. Plan accordingly. Cayman is becoming more and more a place to make money, save the money, and leave with the money. No sense spending more money on a sinking ship. When it finally starts to go under Caymanians will finally get what they want. No expats. A trick to a stress free life. Tell everyone you know not to send anything. Do not have a reason to interact with any post office. Buy overseas. Do not see it as a post office, look at it as a welfare clinic with attendance hours for those that border on being unemployable. The Post Office has no legal proof that they have served notice to customers . Everyone in Cayman, Lawyers, Judges and Legislators included must likely have received Second Notices without having ever received a first. Also, everyone I know receives other people’s mail (a number or two away) in their box on a regular basis. This attempt to fine people is despicable, when the fault most likely is with the Post Office Staff (whose salary we pay). The post office can thinkiabout fines when they no longer take 40 minutes to sell me 15 stamps. I'm talking about time spent at the counter. Next year I won't bother to send Xmas cards, it's not worth the money or the hassle. This is the reason I send my cards home in a pack and have someone mail them on my behalf. Problems solved. The cost is worth it for the reliability. How many people CHECK their box? If you the postal service to run in your behalf, you have to play the part as well. Never depend solely on anything. What will have happened is, the PO head has asked the staff why there are so many parcel uncollected, the staff to cover themselves have told him tis because people wait to pick them up (there is no logic to that either). SO he has thought I'll fine them then they will come and pick up parcels sooner. No thought into the fact the PO staff are just too lazy to send out notifications that a parcel has arrived, ti's almost like they beleive people are psychic. Instead of fining customers, light a fire under the PO employees and make sure they send out the notifications. I'm still waiting for one from October.They will probbably find it soon and chage me for holding it! Just today I picked up a 2nd notice from my PO Box: never received a 1st notice, and I see from the stamps on the envelope that it arrived in Cayman on 6/1/14. Yet more evidence as to the incompetence of the post office. And when you collect it they wil ask you for $5 demurrage, I bet. This has actually happened to me three times at the Airport Post Office – I received a "2nd Notice" slip when I never received a "1st Notice." I've told everyone who would possibly send me a package by mail to never do it again. I have things shipped FedEx or DHL now. Although I have had many bad experiences at the Airport Post Office, I have had much better experiences at the Seven Mile Beach post offices. They're actually even polite in there! It would be really interesting to see how Customs Department disposes it. Is it compliance with best international practices? I recall CIG members attended some postal summit or a conference not long ago.. I have never heard of undelivered packages being destroyed. Once in a while we hear that letters/packages mailed decades ago and then slipped through the cracks were eventually delivered. Then I hope that the post office sends out date-stamped notifications of a parcel's arrival, reminders, or phones people to advise them that a package has arrived, because my repeated epxerience is that I have absolutely no idea that a package harried – both for things I've ordered and packages sent unilaterally, say by my parents. Maybe the post office should ensure it sends out the package slips. I had 1 parcel where I received the notification slip 4 months after it arrived, when I went to collect it the same days it had been returned to sender. While there I asked if I had any other parcels waiting, in case they had lost or not bothered send out the notifications yet, the girl disappeared for 20 minutes, came back with a no and smelling of smoke. I then went down there and asked them to check if they were any parcels 6 times over the next 2 months, answer after a long wait always no. Then I found out they were there all along and had just been returned back to the UK. (no notifications ever sent). I went down again to complain, told them to check in the back again for anything and the same girls tells m, I speak to her supervisor who goes into the backroom and 5 minutes later appears with a parcel that arrived 10 months previously, no notification sent again. And now they are charging for their incompetency? Is this a f….ing joke??? I received a parcel and was NEVER notified. This is now twice that this has happened to me. I only received the last notification (ie that the parcel was about to be returned). The post service needs to get its act together. The service is crap! Unless you can actually ensure and control that people have received notification, there is no way in hell you can justify charging a fee for holding parcels!!!!!!!!!!!!! So if I am off-island for 2 weeks and the PO notifies me through a slip in my PO Box that a package is waiting for me, and I do not return in the 2 week window, you are going to charge me? Does the date that the package arrives on island start the countdown or the date that is on the notification slip? Can we the Public start fining the PO staff for incompetence and being rude towards their customers? Can we fine them when we turn up with said slip and they cannot find the package and are of no help in sorting the situation out? How about we also fine you for ruining suprises when you open up ur birthday presents and cards a month before we are supposed to? How about we fine the PO $1 day until they get their as in gear? Is this new fine a way of generating funds to send Juju to Qatar again? you often dont get the notification for over 2 weeks, the system is SOOOO badly run – any now they want to penalise the customer even more. Just when you thought it wouldnt get any worse..! Just when you thought the "service" could not get any worse. Will enforcement of rules at the post office extend to post office staff actually processing packages in a timely manner? Given I once received a 2nd notice "package to collect" slip some time in July for a Christmas package that had been received in early December (not having ever been sent an initial notice) I would be loath to pay 7 months worth of demurrage due solely to the failings of the post office and its employees.